Fire crews plan to burn approximately 15 acres of piles in the Reds Meadow Valley Today, Wednesday, December 9th. The burn is taking place today in advance of the pending storm. Officials indicated that smoke may be visible from Minaret Vista and Mammoth Mountain. photos courtesy of the US Forest Service, Inyo National Forest. Crews continue to clear trees that blew down in the historic wind event of 2011. Fire crews plan to burn piles in the Reds Meadow Valley this week (December 1st- December 4th) to continue fuel reduction efforts in the valley. It’s worth noting that the wind event that led to the tree blow down in the valley was four years ago this week. Crews continue to whittle away at the incredible amount of downed fuels caused by that wind event — there has been considerable progress made on that front as well. Crews hope to complete 54 acres this week and smoke may be visible from Mammoth Mountain and Minaret Vista. 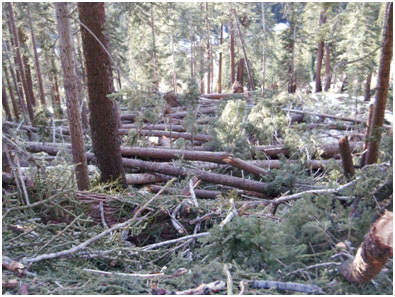 Photo Provided by the Inyo National Forest. 2011 blow down event.